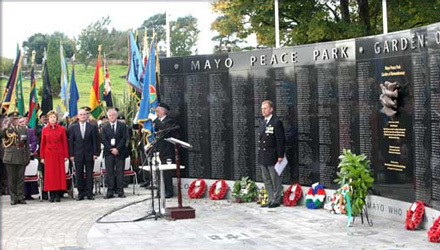 The Mayo Peace Park is a registered charity, operated on a non-profit basis by a local community based committee. The President of Ireland, Mary McAleese, performed the official opening of the Mayo Peace Park, Garden of Remembrance, on Tuesday the 7th of October 2008. The memorial park is situated in the centre of Castlebar fronting the old town cemetery opposite, the Harlequin Hotel. It commemorates all those who served and died in the major world wars & conflicts of the past century as well as in other wars & conflicts. It was developed to remember a forgotten generation of brave heroic local people from every town and village of the county, whose service & sacrifice had been ignored and forgotten, indeed airbrushed out of modern Irish history until recent times. They had served with the Allied Forces in the world wars, in particular with the British, American, Canadian, Australian, New Zealand and South African Forces. The reality was that many of those brave men and women were already emigrants living in those countries, when the wars broke out. In Ireland thousands of others volunteered to join up and they also became emigrants, as a result of this, they had to leave their families and homeland to serve and in many cases never to return again. In Ireland, it was a case of out of sight, out of mind, as those horrific wars were fought on mainland Europe and in other far off lands. Their service and bravery was unknown, outside of the soldier’s own families. It should be remembered that very large numbers of civilians contributed to the war effort as well as soldiers, many of them also lost their lives, working with the essential services of the time, as doctors, nurses, fire fighters, ammunition workers, in the public services, in factories, coal mines, agricultural farms and in all kinds of construction & industry. Mayo men also served and died with the US Forces in the Korean War and Vietnam War, once again they were already living in America when they were drafted or joined up, to serve their adopted country so many thousands of miles away from their Irish homneland. Two of last Mayo men to die in foreign conflicts were soldiers of the Irish Defence Forces, Private William 'Billy' Kedian from Ballyhaunis and Corporal Fintan Heneghan, from Ballinrobe, they died as part of UNIFIL Forces on United Nations peacekeeping operations in the Lebanon. The Mayo Peace Park committee erected a special memorial in their memory; it was the first memorial to commemorate them. The most recent Mayo soldier to die in action, was a young Royal Marine named Robert McKibben from Westport, he died in Afghanistan on the 12th of November 2008, his funeral was one of the largest ever seen in Westport, this had a profound effect on the whole community, it really brought home to everyone the brutal reality of war and a better appreciation of those who died for the peace we enjoy in our world. Robert McKibben was a long time member of the Irish Defence Force Reserves before he joined the Royal Marines. There is a special memorial dedicated to Robert in the park, he was the first Mayo soldier to be killed in action since the park was opened. It honours the memory of all the officers of An Gárda Síochána and soldiers of the Irish Defence Forces who gave their lives in the service of Ireland. The Mayo Peace Park, remembers all those brave people, in a most respectful manner, it is a tranquil oasis of peace and respect, it offers the families of the fallen, a place to say a silent prayer and reflect on the lives and sacrifice of their loved ones. The Mayo Peace Park has consigned the ignorance and bitterness of the past into history. It does not attempt to glorify or justify any war, its purpose is to commemorate the memory of the Mayo people who died in them. The founder of the Mayo Peace Park, Mr Michael Feeney, dedicated most of his life into painstakingly researching the names and details of all those who died, this was an enormous task, which took over thirty years to complete. He readily acknowledges that a number of like-minded people assisted with the ongoing research as time went on. Those names are now inscribed on the black granite memorial stones in the Mayo Peace Park, in addition to this, he produced a special commemorative book entitled 'Remembering Mayo’s Fallen Heroes', this 328 page book, has received wide acclaim, it is a must for anyone with Mayo connections or indeed an interest in local history. It contains many interesting articles and stories as well as a comprehensive listing of those who died. The book is still available & can be obtained by contacting info@mayopeacepark.ie or directly from Michael Feeney MBE, Milebush, Castlebar, Mayo, Ireland.